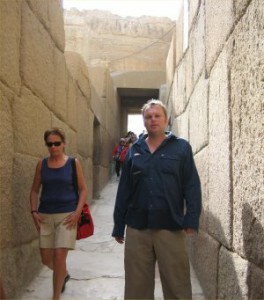 Tour of Egypt and Jordan with the Adventure Company – Cairo. 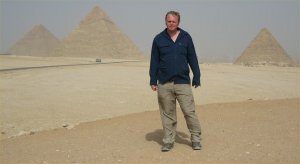 I had only been back from India/Nepal 10 days, when I set off, once again,with the Adventure Company on a Pyramids to Petra Trip.With both the Pyramids and the Ancient City of Petra on the blue list, it made perfect sense, with loads of great stuff to do in between.The classic “Three Pyramids” shot in Giza. I arrived at midnight. Things weren’t great, the airline had left my back behind, and I would have to manage for 24 hours, with just my day sack and the clothes I stood in (not ideal, considering I was wearing a fleece jumper).The good news, was I met up with a really nice couple called Audrey and Ralph. 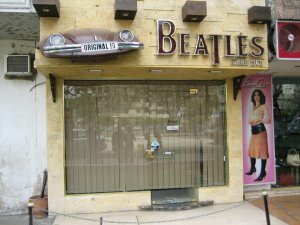 The tour didn’t start properly until following day, so we decided to wander around and see the City.This Beatles shop reminded me of home. 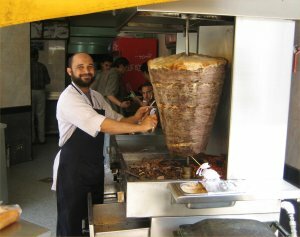 A saw this “God of Kebabs” as we walked around.Ralph and I gave this guy a bit of money, for allowing us to photograph him. The following day, the tour begins, with a visit to the Egyptian Museum.It was quite superb, and really captured the ambiance of the old museum in Raiders of the Lost Ark.Unfortunately, camera’s were banned, so I don’t have any pictures. My favourite artifact was King Tuts gold mask. I also saw the substitute Rosetta Stone (made of plastic) donated by the British Museum (I have since visited London and seen the original). After this, we travelled to Giza, to see the Pyramids. I think this picture captures its sheer size. 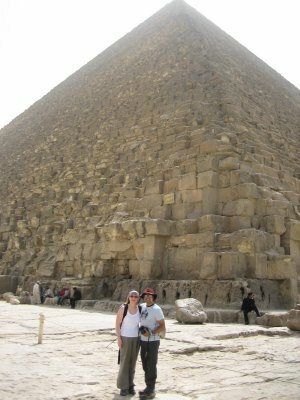 I found the only way I could capture the majesty, was from one of the corners (this is a picture of Aud and Ralph).I had been told, that when you visit the Pyramids, you would be constantly bothered by people trying to sell various things.Our guide, had arranged some “outriders” to intercept them, and we were able to enjoy the experience without interruption. 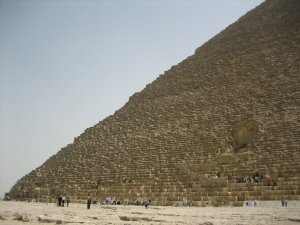 I had also heard that when you drive from Cairo to the Pyramids, you travel in an armed convoy, this didn’t happen either, just an air conditioned mini-bus. 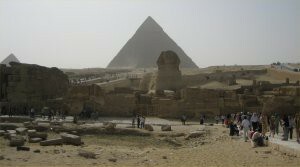 I walked around the base of this Pyramid, it was a special moment. 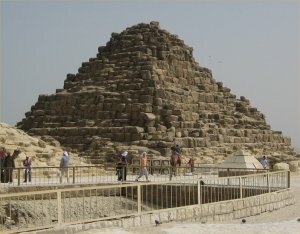 One of the smaller Pyramids, dedicated to the Pharos wives. 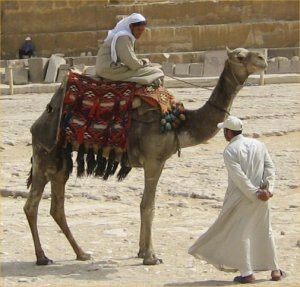 I considered getting a shot of me on a Camel, in front of one of the pyramids, but decided against.I have ridden Camels on 3 continents, and although functional, I find it very comfortable. Our guide was able to advise on all the best shots.This classic of the Sphinx, in front of one of the pyramid of Khafre.It was said at the time, that the beard of the Sphinx is stored in the British Museum (I couldn’t find it). Inside a structure near the Sphinx.Couldn’t find out anywhere what it was actually called, main thing I remember is a little boy trying to overcharge me for a can of coke.I took the opportunity, to teach him some of the Newton Heath dialect from my homeland, which I had learned in my youth !. This had the desired effect, and he returned my money. 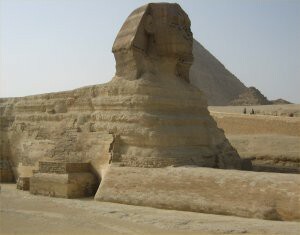 The actual Sphinx itself, taken from a nearby rampart.It was much smaller than I had expected it to be (which was interesting, as the Pyramids were much larger than I had expected them to be !). 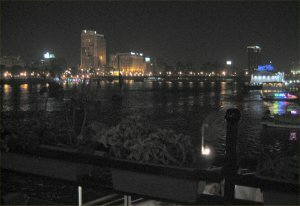 In the evening, our guide takes us to one of the large riverboats, docked on the side of the Nile.The food was excellent, and the atmosphere of sitting next to the Nile really made the experience.Many people had told me that Cairo was an awful City, dirty and full of Nasty people. 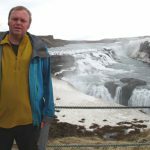 I didn’t find that at all, and I have visited far worse cities described as Jewels of there location (Prague is one that springs to mind). 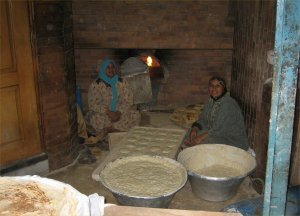 As we left the restaurant, these fine ladies were preparing and baking bread.They were happy to be photographed, and when I handed them a small amount of money (I had after all, stopped them from working, so I thought it was right to give them something) they seemed delighted with the transaction. 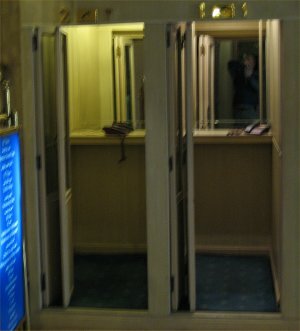 This is the picture of two of the telephone cubicles in our hotel.This picture serves no useful purpose, except that in the film Moonraker, James Bond is having a meeting with somebody.The person is summoned to a telephone call, and then killed in a cubicle like that. When I saw them I immediately thought of that scene, and that’s why they are photographed here. 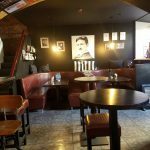 As we returned from our evening out, I was disappointed to find that the bar was closed.Most of the other people on the trip, fancied a nightcap, but what were we to do. 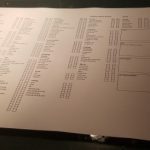 When I spoke to the hotel Manager, he indicated that I might want to talk to the hotel porter.The porter simply told me that I would need a room of my own to host a “party” (which I had). He asked how many cans I wanted, told me the price for the cans, his fee, and the cost of a taxi. The deal was struck, and the cans were delivered to my room. One of the girls on the trip had a set of speakers for her mobile phone, and we all had a pretty cool 2 hour party. 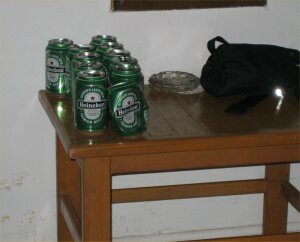 These are some of the leftover cans, the morning after.